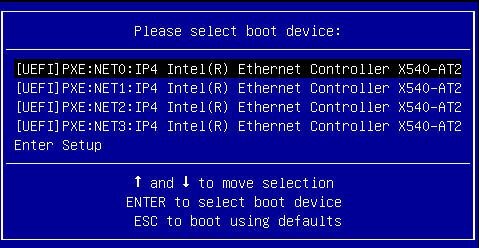 The Boot Options Priority list displays the boot device candidates for the system. In addition to using the F2 key to view or edit the system BIOS settings, you can use the F8 key during the BIOS startup to specify a temporary boot device. This selected boot device is in effect only for the current system boot. The permanent boot device specified using the F2 key will be in effect after booting from the temporary boot device. From the local server, press the On/Standby button on the front panel of the server to power off the server, and then press the On/Standby button again to power on the server. After the server resets and begins the initialization process, press the F8 key (or Ctrl+P from a serial connection) when prompted while the UEFI BIOS is running the power-on self-test (POST) to access the boot device menu. In the Please Select Boot Device dialog box, select the boot device according to the operating system you elected to use, and then press Enter. 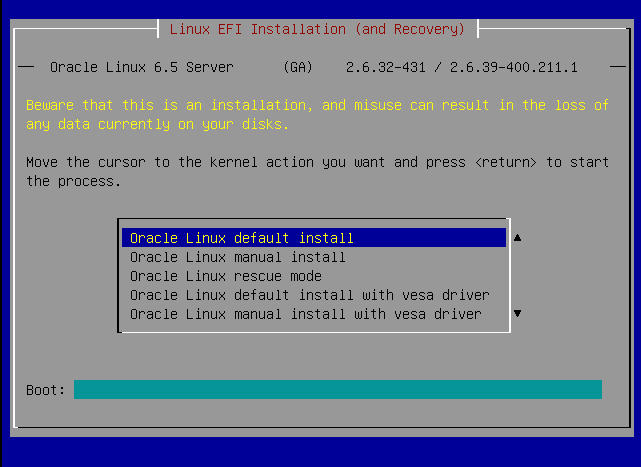 Follow the on-screen instructions to install the operating system from the selected boot device.